Vedantu.com - No.1 online tutoring company in India provides you Free PDF download of NCERT Solutions for Class 7 Maths Chapter 6 - The Triangle and Its Properties solved by Expert Teachers as per NCERT (CBSE) Book guidelines. All The Triangle and Its Properties Exercise Questions with Solutions to help you to revise complete Syllabus and Score More marks. Register for our free webinar class with best mathematics tutor in India. With the basic knowledge of lines and angles, students of Grade 7 learn about Triangles and further concept through NCERT Grade 7 Mathematics Chapter 6, The Triangle and its Properties. Introduction to Types of Triangles, Medians Of A Triangle, Altitudes Of A Triangle, Exterior Angle Of A Triangle And Its Property, Angle Sum Property Of A Triangle, Two Special Triangles : Equilateral And Isosceles, Sum Of The Lengths Of Two Sides Of A Triangle And Right-Angled Triangles And Pythagoras Property are some of the major topics covered in this topic. The chapter begins by introducing the basic types of triangles to the students. It further deals with the maximum height of the base of the triangle to the vertex i.e. altitude, the angle beyond the triangle boundaries, special types of triangles and other concepts that help to build the foundation of the students learning of Geometrical shape – Triangle.A very important concept learnt in NCERT Grade 7 Mathematics Chapter 6, The Triangle and its Properties is the Pythagoras property that shall be with the students learning till higher grades.New concepts, interesting problems, solved and unsolved examples and simple language, make the chapter interesting and fun to learn. Summary, Do Yourself Activities and Group exercises help the students to dive into the world of Triangles with a throttle and master the topic.Pictorial representation and graphical representation makes the chapter more interactive and clears the concepts in a better and comprehensive manner. 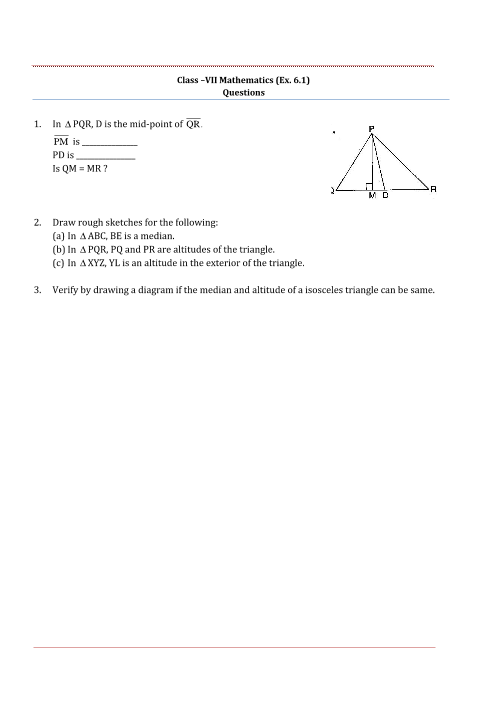 Get 100 percent accurate NCERT Solutions for Class 7 Maths Chapter 6 (The Triangle and its Properties) solved by expert Maths teachers. We provide step by step solutions for questions given in class 7 maths text-book as per CBSE Board guidelines from the latest NCERT book for class 7 maths. The topics and sub-topics in Chapter 6 The Triangle and its Properties are given below. Ex 6.8 - RIGHT-ANGLED TRIANGLES AND PYTHAGORAS PROPERTY. EXERCISE 6.5 - 8 Questions with Solutions. Other than given exercises, you should also practice all the solved examples given in the book to clear your concepts on The Triangle and its Properties. You can also download the free PDF of Chapter 6 The Triangle and its Properties and take the print out to keep it handy for your exam preparation.